Top call btn 1-g home st.
Design diversity thanks to integration in the design line. 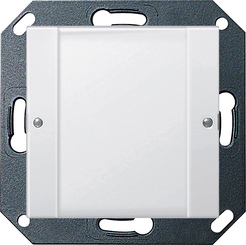 This facilitates the uniform appearance of the door communication and electrical installation. Signal transmission and supply of the audio and video components via reverse-polarity-protected and short-circuit-proof 2-wire bus. Modular design, allowing easy installation and expandability. Inscription space can be exchanged without tools and without frame disassembly. Professional labelling is available from the Gira Inscription Service www.marking.gira.com or using the Gira inscription software. Extension of the home station with an additional call button for implementation of the free in-house intercom communication between two home stations or for switching in conjunction with the switching actuator or flush-mounted switching actuator. Integration possible in Profile 55. The intermediate plate 55 x 55 mm is required for integration in the Stainless Steel Series 20/21. In just four steps, you can create an inscription for your Gira product and send us your design concept. First select your product. Then enter the desired text and specify how it will appear. You can use a preview function to check your design and view it as a PDF document. Finally order the inscription you have designed via our convenient online service.